Short is in these days. Letter writing fell by the wayside long ago, but today’s teens have moved on even from phone calls and email. For staying in touch with friends, the text is king. According to a new study from the Pew Research Center “fully two-thirds of teen texters say they are more likely to use their cell phones to text friends than to talk to them by cell phone” and “half of teens send 50 or more text messages a day.” Though teens haven’t taken to Twitter as widely as adults, roughly 10% of high schoolers are tweeting their lives. In this landscape of 140-character limits, a French writer from the early 1900s has unexpectedly regained relevance. Throughout 1906, Félix Fénéon anonymously contributed short blurbs of reportage to the Parisian newspaper Le Matin, filling in space in the paper’s layout. No more than a sentence or two apiece, these micro-stories offered glimpses into the curiosities and excitement of day-to-day life; murders, celebrations, and romantic misadventure were all common themes. 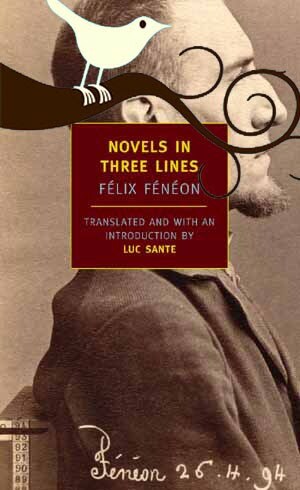 In the 1940s, after Fénéon's death, some thousand of these items were published as Novels in Three Lines (Nouvelles en Trois Lignes - in translation the title loses its pun; the French nouvelles signifies both novels and news). (Also discussed from a different angle here!) Read in collection, they offer up a surprisingly comprehensive panorama of turn-of-the-century life. Reading a book about a butler named Jeeves may strike you as a bit dull. Don't butlers just stand around and open doors? Well, there's a lot more to it, of course, including -- rich uncles, angry aunts, lovesick pals, crooks, cronies, choir boys, newts, nuts and wildly preposterous schemes cooked up by Jeeves himself. But, yes, there are doors to be opened and Jeeves has a way of making even this dramatic, funny or both. Or perhaps I should say the author, P. G. Wodehouse (pronounced Woodhouse) has a way. But that would be an understatement. Two years later, he is older, taller, and about to graduate from high school. Myles still counts Amelia Atwater-Rhodes among his favorite authors, and he comes by the store at least three times a week. If you were to come by the shop while we were talking, you would probably hear one or both of us break into laughter at some point. No, not "probably." Make that "definitely." Before Myles moves across the country to attend college, where he will undoubtedly acquire a new accent and grow rather fond of brick buildings, I thought we'd discuss how his literary preferences have changed since we posted that first survey, and celebrate his successes as a writer. Little Willow: How have your tastes in books changed since you were a sophomore? Myles: I'm off the vampire phase. The concept is still appealing, but that genre of books no longer interests me because their new appeal is single teenage girls. I like urban fantasy, I still love thrillers, and I have increasing appreciation for realistic literary young adult fiction. Little Willow: You have written poetry, short stories, and plays, and intend to also write novels someday. How has your writing changed in the past two years? I was really impressed recently with You Have Killed Me, a new graphic novel from Jamie S. Rich and Joelle Jones. This one has it all, and it starts with the first-rate design by Oni Press. The cover is awesome (please, feel free to judge this one by the cover), but it’s the story that really sings -- and for fans of the genre in particular, it is an absolute killer. Set in 1939, the plot centers around P.I. Mercer and two women -- one who has hired him, and one who is missing. Mercer has a long, complicated involvement with the missing woman and her family, so this one is personal. All too fast, his questions find him with more clues than he can believe. There is the upcoming marriage to the wrong guy, the gambling habit that has drawn the attention of the powerful bad guy, and the attraction for the black trumpet player who had to know he had no real shot with the rich white dame (but tried anyway). Mercer gets beat to hell and back -- the story actually opens with him getting shot, and then flashes back -- and the twists and turns are perfection. From cops who push him around, to a murder at the racetrack, to revelations hidden behind wide, innocent-looking eyes, "classic" does not even begin to describe this book. And don’t think you have it figured out, because trust me, you don’t. 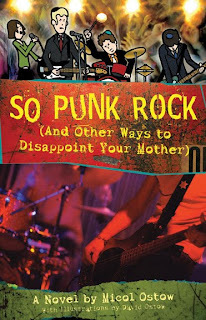 Cross posted from my April column at Bookslut. Background: When I was fourteen my parents found my poetry journal. It wasn't more than a little stick-in-your-pocket book. Tiny. I'd write poems in different colors. You know, the way the real artists did it. It vaporized from my toolbox/hiding place, leaving the tools and other camo in place. I wish I remembered any, ANY of those poems. I know they were powerful, I know they were from my heart. Part of my heart went with them, to whichever landfill bequeathed. Every summer, Matt and his two best friends, Cooper and Sean, set a goal for themselves and compete to be the first to achieve it. In the past, they’ve done pretty random, useless things, like collecting a thousand golf balls. This summer, the guys are fifteen years old and their goal is to see a naked girl. In person. A real girl, not a picture from a magazine or online. A guy could easily get himself into some embarrassing situations trying to do this. Then again, maybe volunteering to swim in a 100-yard butterfly race in an attempt to impress a girl although you can't actually do the butterfly could lead to even more humiliation. 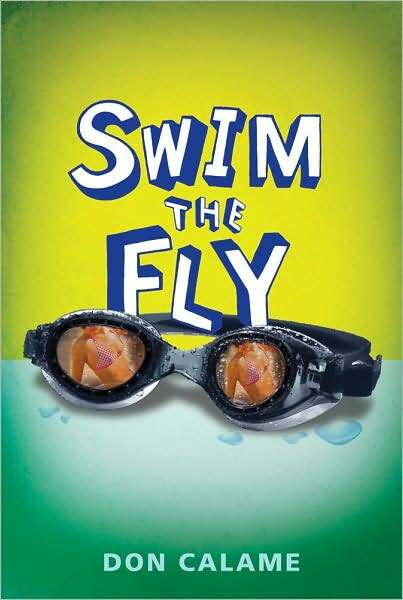 If Swim the Fly by Don Calame was a movie and Ben Stiller could play a fifteen-year-old guy, he’d be Matt, and I think this describes this book pretty well. It's funny in a wince-inducing, how-many-more-embarrassing-situations-can-this-kid-find-himself-in? way that includes bodily functions, awkward moments involving relatives, and more. Fast-paced, with short chapters, this would be a great pick for teens looking for something fun to read, and especially for reluctant readers. And folks who are already fans of Swim the Fly will be pleased to know that a "quasi-sequel to Swim the Fly told from Cooper’s point of view" is in the works. For everyone who has participated in the GLW/Operation TBD event to get books to the students on the Navajo Nation and White Mountain Apache Reservation, please know that we have sold out! Through your support, 772 books were bought for Ojo Encino Day School & Alchesay High. I can not begin to thank you. I will talk to both schools on Monday and report back with their thoughts. This is amazing!! Behind the cut, see the schools' initial response and what many folks have sent. By the time I was thirteen, discussions at my house about what I would or should "do" when I grew up became more serious, and "movie director" was no longer an acceptable answer. The going assumption was that I'd be best suited for "something with computers." I enjoyed tinkering with my Commodore 64 and Apple II, though it was hardly a pure love; I made my own video games when we couldn't afford the commercial ones. I developed bridge controls from the Enterprise, text adventures, even a few science applications. I entered programs from magazines like Ahoy! and Compute, line by tedious line. I learned to incrementally isolate and solve problems, one error at a time. I'll admit that the prospect of growing up to isolate and solve problems under the green glow of a computer screen did not inspire me to race headlong into maturity. I dragged my feet as long as I could, hiding in my books, goofing off in school, hoping something might yet save me for a life of imagination. And then I read A.K. Dewdney's The Planiverse. There, I discovered the answer to the age-old choice between right-brained and left-brained, imagination and reason, creativity and science, English and Engineering. The answer was, "Yes, both, please." My favorite comic book store--Haven Comics--has a smart, enthusiastic staff and a come-hang-out vibe. Unfortunately, it's a small place and a little tricky to find, tucked behind a strip mall and not visible from the street. Haven is a great place, but to find it you almost have to already know where it is. Comics fandom has a similar problem. On one hand, this is an amazing time to read comics. Artists and writers are constantly experimenting, constantly discovering new things the medium can do. But on the other hand, specialty shops have replaced the drug store spinner rack and massive crossover events have replaced simple story arcs, making it difficult for new readers to figure out what's going when they first pick up a book. Comics are great, but to find your way around, you almost have to already know you way around. 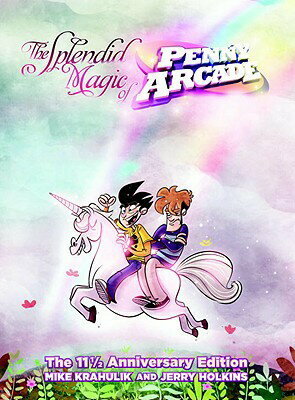 Penny Arcade is, of course, the decade-plus long "webcomic" (actually around for 11.5 years as of this volume's publication, hence the subhead "the 11 1/2 anniversary edition"), started by writer Jerry Holkins and artist Mike Krahulik. With the help of eventual third partner/consigliere Robert Khoo, they spun the sharply-honed strips and staggering web traffic into several other enterprises, notably the "PAX" gaming con (for "Penny Arcade Expo" -- a Comic-Con with a heavy-on-the-games slant), and the "Child's Play" charity, which reaches out to gamers to provide toys to hospitalized kids the world over. "Splendid Magic," recounts much of the "backstage" story of the improbable rise of "Tycho" and "Gabe" -- comic alter-egos o creators Holkins and Krahulik. Their story is a good one, since they started out in the "who'd be crazy enough to put comics on the web?" era, and profited mightily by doing so. Still, this is more a book for those who are already fans -- the "making of" feature on the DVD, as it were, more than the feature itself. In Poster Boy, Graydon Fallon's life comes crashing down around him when his 12-year old sister, Maggie, is diagnosed with cancer. Until this moment, the 16-year old has really only cared about video games, his friends and how far he can get with his girlfriend, Natalie. Graydon loves having the basement to himself so he can party with his friends. Everything seemed so simple until now. Maggie, who wants to be a scientist, is diagnosed with rhabdomyosarcoma, a rare form of cancer. Stunned by this news, Graydon researches cancer and what could have caused his sister's illness. As he locates overwhelming lists of carcinogens on-line, he begins to obsess over his findings and eventually wants to move to an organic farm and live like a caveman. His story gets media attention but it becomes more difficult than Graydon thought to live naturally. Every part of Graydon's life changes throughout the book, especially the relationships with his classmates and his parents. Graydon and his mom react similarly, however, Graydon can not understand his father's perceived indifference and the two seriously clash. Crane has a deft touch mixing in a bit of humor to the story, including awesome Chuck Norris jokes. The plot is also accented with Maggie's science project where she verbally abuses one set of plants while loving the other set. I found Graydon to be quite unlikable but the story of his quest to change things despite his iffy intentions was fascinating. Fans of Norma Howe's The Adventures of Blue Avenger will enjoy also Poster boy. 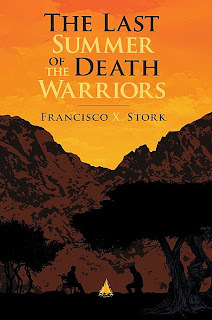 When I tell you that Francisco X. Stork’s The Last Summer of the Death Warriors is a story about the meaning of life, I’m not kidding. I'm not making a dramatic statement just to be dramatic and make you want to rush out and get your hands on this book. The best way to describe the story is to say that it explores the meaning of life. In his novel, Stork’s two main characters wrestle with their inner demons and try to answer some of life’s biggest questions: What is my purpose? How should I live? What matters most? This is not a reading experience for someone who needs action on every page. It’s for readers who appreciate subtlety, who like to think about characters’ motivations, who enjoy reading authentic conversations and for whom watching the growth of character happening throughout the narrative is just as compelling as nail-biting scenarios or intricate mysteries. It's a beauty, in a quiet "I could be a great indie movie" type of way. After the deaths of his father and his sister in the span of just a couple of months, seventeen-year-old Pancho ends up at a Catholic orphanage. Even though the cause of his sister's death was "undetermined," he can't get the idea out of his head that she was murdered by the guy she was seeing, and he can think of little else besides finding that man and killing him. Revenge is all there is for him. He literally cannot imagine living without avenging his sister's death. Then he meets D.Q., another teen at the orphanage, who is dying of brain cancer. D.Q. is quite a character. He hardly ever stops talking. He has a lot opinions and he is busy working on writing The Death Warrior Manifesto, in which he is attempting to outline how best to live one's life. As soon as he meets Pancho, D.Q. latches onto him and decides that their fates are intertwined. He invites Pancho to go with him to Albuquerque where he'll be getting experimental treatment for his illness, and where he hopes to win the love of a girl he met there named Marisol. Pancho agrees to go with him, but mostly because the journey brings him closer to getting the revenge he is desperate for. Their travels take both young men in directions they hadn't predicted. 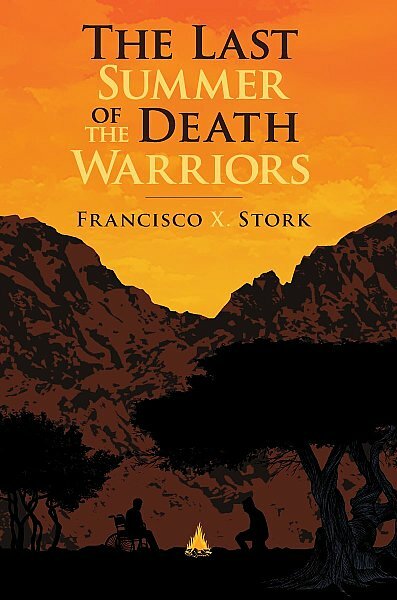 One of the many remarkable things about The Last Summer of the Death Warriors is that it doesn’t turn preachy, at any point, even though it is filled up with wisdom for readers to take away. Also, the characters feel real, not like mouth pieces for some kind of message. They talk the way teens would. They relate to one another the way real teens do. You can imagine that two friends going through something like this would act just this way. You believe it. I just loved the idea that often when we're facing something big in our lives (like death) we tend to look for or expect some sort of grand revelation to happen so that we "get it," but that life doesn't usually work that way. There may not be a grand revelation, but there's a good chance you'll still learn something, some small piece of meaning might be found. I think that The Last Summer of the Death Warriors has the power to change your life a little bit. It's that good, that thoughtful and moving. I think it's part of the answer a lot of us readers seek, a piece of that bigger "something" we wish to understand and that the best stories sometimes offer. The Last Summer of the Death Warriors is published by Arthur A. Levine Books. Go get it. The humorous short stories of Simon Rich are what you might expect if, say, Calvin and Hobbes had been written by a sarcastic 20-something Woody Allen. In Free-Range Chickens, Rich's most recent collection, a kid loses his first tooth and is dismayed not only that there is a fairy that comes and takes teeth, but worries there might be an eye fairy or a face fairy and – the horror! – his parents are in cahoots with them! Rich has a particular fondness for re-imagining the child's world through an adult prism, or maybe it's the other way around. 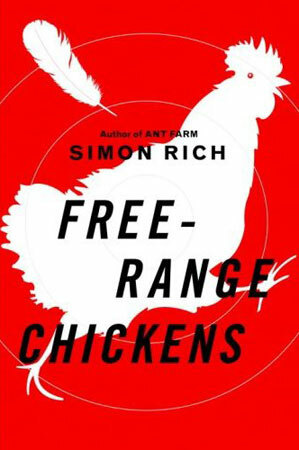 In his first collection, Ant Farm, his "a conversation at the grown-ups' table as imagined at the kids table" is the sort of bizarro world humor that used to be the stock and trade of the old National Lampoon, when they were a magazine and not a cruddy movie brand. Mom: Pass the wine I want to act crazy. Or perhaps there's the dismay when a third grader is introduced to a calculator. Me: You mean this device just...does them? By itself? Teacher: Yes. You enter in the problem and press equal. Me: You...you knew about this machine all along, didn't you? This whole time, while we were going through this...this charade with the pencils and the line paper and the stupid multiplication tables!...I'm sorry for shouting...It's just...I'm a little blown away. With each short vignette – most in the two- to three-page range – Rich finds the comical nugget of each "what if" and finds a way to use the natural precociousness of innocent eyes to vocal very mature absurdisms. Today, I'm talking about Poetry Speaks Who I Am: poems of discovery, inspiration, independence and everything else, edited by Elise Paschen and Dominique Raccah. The good people at Sourcebooks, the force behind the bestselling books Poetry Speaks (for adults) and Poetry Speaks to Children (for the elementary-school set) have come out with Poetry Speaks Who I Am, a collection of poems designed to appeal to kids in middle school, although given the sophistication of the collection as a whole, it seems appropriate for high school as well. The editors apparently "asked poets to send poems either that were important to them at [middle-school] age or that they'd written about being [that] age". They went through hundreds of submissions to put together this really interesting collection, which is a combination of long-dead poets (Poe, Whitman, Keats, Dickinson) and contemporary poets (including Ron Koertge, interviewed here last month, Sherman Alexie and U.S. Poet Laureate Kay Ryan). What are friends for, my mother asks. casserole unbaked for sick Jane. Someone has just made her bitter. they touch you. They fill you like music. As spring started showing itself here in the Rockies, I was delving back into winter with Cold: Adventures in the World's Frozen Places by Bill Streever. A very readable scientific romp through topics as varied as meteorology, absolute zero, Artctic and Antarctic expeditions, the Children's Blizzard, hibernation, human and animal adaptations to cold temperatures, and the development of refrigeration, Cold will have you wondering, wanting more, and shivering. Streever walks us through a year in the cold, starting in July near the Arctic Circle and ending the following June in the same place. Whether you're interested in climate change, hibernation habits (the word "frogsicle" came to mind when reading about how the nearly frozen wood frog spends the winter) or weather prediction, there is something in this book for you. Streever touches on many topics just enough to peak your interest while at the same time giving you an overall look at the many aspects of cold. Building a house in Alaska? Better consider what will happen when the heat from your home starts to melt the ground underneath it. Do you know the difference between hypothermia and frostbite? What are the best fabrics for humans to wear if they want to survive in below freezing temperatures? What does an early bicycle prototype have to do with cold weather? And how did the nation's weather predictors miss what became known as the Children's Blizzard of January 1888, a storm that claimed the lives of at least 250 of the estimated 20,000 people who were surpised by the storm, stumbling, lost, some of them only a few feet from shelter? This is both an engaging, personal account of cold and a well-researched (and indexed, and cited) book that could lead you in any number of directions for further reading on topics that caputre your interest. What does cold mean to you, personally, and to the world in general? If you don't have answers to these questions now, reading Streever's Cold might get you started on formulating them. To hear NPR's take on Cold, an interview with Streever and him reading excerpts from the book, click here. Cross posted at Dwelling in Possibility. Comic books have produced few characters as charming as Rabbi Harvey. Possessed of a powerful wisdom and a quiet confidence, he also has a self-deprecating sense of humo r and is shy enough that he sometimes gets nervous around girls (one girl in particular, actually). The hero of the Adventures of Rabbi Harvey and Rabbi Harvey Rides Again, he has kept the peace as sheriff of Elk Spring, Colorado (a frontier town that appears to be peopled exclusively by Jews) not with the quick draw of a six-shooter, but with the judicious application of wisdom, wit and ancient Jewish allegory. The Rabbi returns now in his most (intellectually) daring adventure, Rabbi Harvey vs. 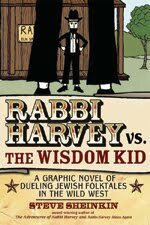 The Wisdom Kid (by Sheinkin), which pits the pancake-loving Rabbi against his greatest (philosophical) rivals who have hatched a sinister plot to run him out of town for good. The nefarious Bad Bubbe has called her son, a Rabbi himself, into town to ruin Harvey's reputation and land him in the hoosegow, then take over as the town's wisdom-dispensing (and money-grubbing) authority. Needless to say, Harvey doesn't lie down without a (verbal) fight and the whole thing ends up in a wisdom-showdown at the corral. As always, the off-kilter art ends up being remarkably evocative of the time and tone and supports the unique and subtle brand of literate humor that the Harvey books have perfected. Most surprising of all is how painlessly you will find that reading this has imbued you with a few notes of genuine wisdom. 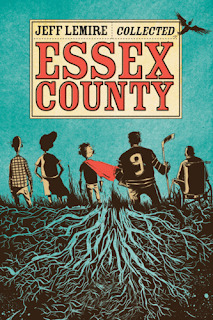 If Harvey ha s whetted your appetite for quiet wisdom and pastoral settings, do take a look at Essex County (by Lemire). 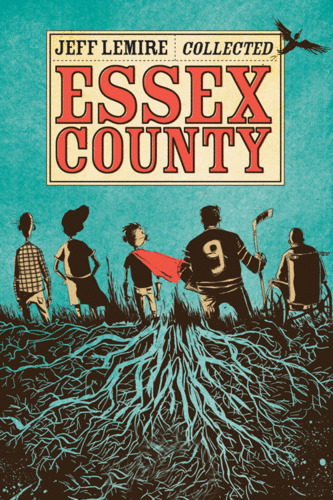 The diametric opposite of Harvey's tone, Essex County details the lives of various inhabitants of a small Canadian farming community in small black and white dramas that strike straight at your heart with universal truths about family, friendship and loneliness. My favorite of the three main stories and two shorts is the first, Tales from the Farm, about a boy living with an uncle he hardly knows, who is looking to define his existence through parents he can hardly remember. But when he finds himself befriended by a hulking stranger, he has to start making choices about who has his best interests at heart and what growing up is really all about. Another book guaranteed to leave you a little wiser for the reading. Stories have their purposes. We tell ourselves (and others) stories about our world in an effort to make sense of it. Call me strange, but I like scripture, whether it's from a Middle-Eastern monotheistic religion (Think about the Trinity - is that monotheistic? Seems like three is more than one. But I digress...), or from other parts of the world. All cultures seem to have their creation stories, and many here in western civilization believe (or have accepted?) the story put forth in the first book of the Bible, Genesis. Of course, the fossil record shows that our planet is far older than Genesis suggests. 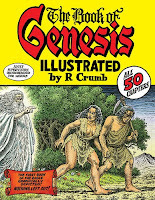 The Book of Genesis, illustrated by R. Crumb, includes all fifty chapters. The creation story, Noah and the ark, and the story of Joseph and his brothers, are just some of the tales illustrated. Knowing the stories in Genesis is not necessary. But one may (Maybe not!) 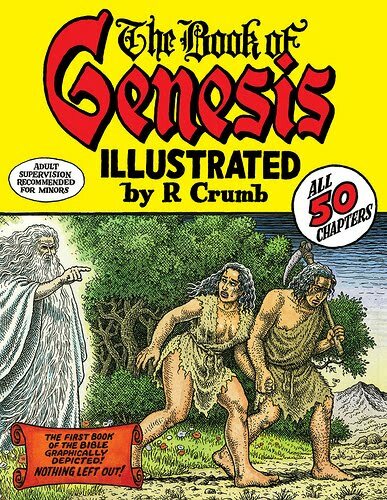 understand western civilization's strange history better by getting to know its foundations, and R. Crumb's glorious illustrated Genesis is a fun way to try. A reviewer in Booklist wrote, "Crumb's vivid visual characterizations of the myriad characters, pious and wicked, make the most striking impression. His distinctive, highly rendered drawing style imparts a physicality that few other illustrated versions of this often retold chronicle have possessed." Oh, and God is one of the myriad characters. Yow! What a character! I guess I started reading Crumb's underground comics around forty years ago. For what it's worth, I'll read every book in the Bible if R. Crumb does the illustrations. Nothing beats reading. But when you are unable to read because you're, say, raking the leaves from the front lawn, or painting the bathroom blue, or driving to New Mexico, then listening to a good reader read to you can be a valuable substitute. And when the reader is reading some well wrought science fiction, well that's nigh on priceless. The three podcasts reviewed below will get you started on the world of podcasting in science fiction. There haven't been very many good novels about popular music. It could be due to the inherent contradictory nature of writing in concrete terms about something so ephemeral, even when the writers are also musicians. Music is such an individual experience that it can be daunting to find the absolutes in it. P.F. Kluge got it right in his 1980 novel Eddie and the Cruisers. Yes, it's the source for the 1983 cult film, and it's set in a time when music came pressed into the grooves on big plastic discs, but forget that for a moment. What Kluge does is something harder, and deeper, than the film's mere missing-album mystery, and it's something that people of any age who are passionate about music will understand. Kluge shows us the limits of the music, and how real talent sees it and pushes past it. He demonstrates where Leaves of Grass and "Hound Dog" coincide. Ari Abramson has a dream. And that dream is to be a rock star. Now all he needs is a band with the ability to play some songs. And fans. (One fan in particular, really. When Sari Horowitz signs on to IM, Ari suffers fourteen heart attacks and multiple mental meltdowns just THINKING about how to begin a conversation with her.) Oh, and he needs for his parents not to find out -- they want him to focus on getting early admission to Brandeis. Where -- even if he wanted to think about college right now (which he doesn't, as it's two years away) -- he doesn't want to go. But the band actually comes together, and with Jonas (activities: basketball, being a bad-a** pimp), Yossi (activities: study of rabbinical interpretations of scripture), and an uninvited-yet-turns-out-to-be-awesome back-up singer, Ari forms The Tribe. And they enjoy surprisingly quick rise to stardom -- especially at Leo R. Gittleman Jewish Day School. That's when egos begin to get inflated. And the romance he's been dreaming of... doesn't go exactly the way he'd planned. And while his dream has technically been fulfilled, he is faced with more problems than he had when he was just dreaming. I have been anticipating this book for a long time and was so excited to get an early look at it. I love David Levithan's work and while I've only read one thing from John Green (his story in Let It Snow), I love his vlogs and sense of humor, so the two of them together was like Awesomeness squared. The novel did not disappoint or, well, at least not much. What I thought was funny was that I switched which Will Grayson I wanted to read most a little ways in. The chapters alternate between each one, and they have their own distinct style and voice. WG1 is (I think) John Green's, and WG2 is (I think) David Levithan's; the two are easily distinguished by the fact that WG2 does not use caps (not even at beginning of sentences), except for like one or two instances, and the story for those is written almost like a screenplay. I originally wanted to read WG2 most as he was gay and I'm naturally drawn to that (being a gay man myself), but he was too emo for my tastes and I was really put off by him after the first chapter so I went with WG1. But then I switched back around halfway through. I loved the character of Tiny and kinda wish there was a book written from his perspective. He's such a larger-than-life character and is the one character that is present in both stories after the two Wills meet. The concept of them meeting is interesting and I was wanting to see how it would all play out. The story has got a lot of humor, heart, and revelations that make you think about your own life and how you live it. I was not a big fan of the ending because it felt abrupt to me. If the acknowledgements had not been right on the next page, I would've thought they had failed to print the rest of the story since there were several blank pages after that. There were a lot of threads left undone (and one that started on the second-to-last page- WHO DOES THAT?! ), but not enough for a full novel (I don't think). I feel like several characters were just left hanging and I'm left wondering what's going to happen to them. So someone please tell me there will be a sequel or something in the future. Overall though, it is a very good book and a compelling read that's hard to put down. Also, the musical mentioned in the summary is FABULOUS and the lyrics to some of the songs are just hilarious. Those are worth the price alone!